Dynamic Fan supplies an extensive array of commercial fans for many different uses and needs. Whether you are looking for a small fan to keep air throughout your storefront clean, cool and fresh, or you are looking for a larger fan for expelling large levels of heat, dust, paint or fumes, Dynamic Fan can provide you with the ideal model. We also sell, install, maintain and repair laboratory exhaust systems. Lab exhaust systems are designed to protect laboratory buildings from dangerous, toxic flames by forcing them away from the building. Selecting the right commercial fan will reduce electricity costs while maximizing the clean, cool air throughout your business. You can find a smaller fan to place around your shop or install a larger fan to complete or expand your ventilation system. 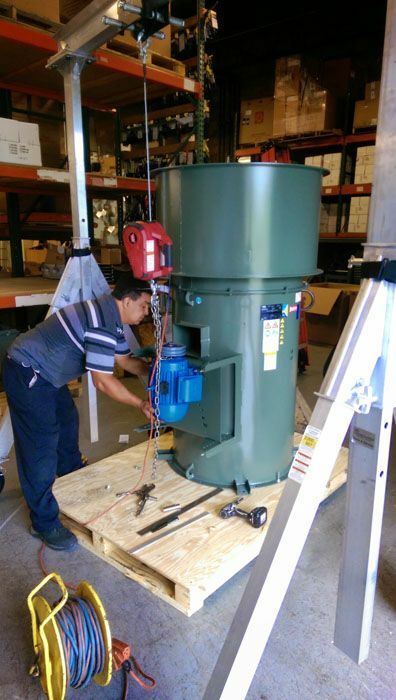 Depending on the speed, size and capabilities you are looking for, the helpful staff at Dynamic Fan can help you find the right model. Dynamic Fan provides installation, maintenance and preventative maintenance services to ensure your fans and blowers are always working properly. We can also provide you with replacement parts, such as a motor, bearing, shaft, pulley or belt, depending on your specific needs. If you have any questions whatsoever regarding commercial fans, please contact us today.